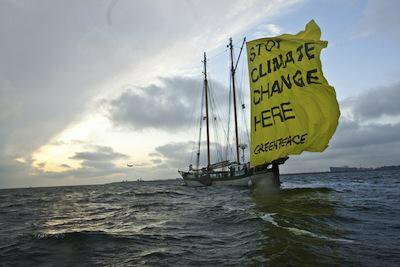 Greenpeace sailing ship. Demotix/Janine Stengel. All rights reserved.Transnational activism itself is not new, nor even is the concept of ‘global citizenship’. Various forms of international solidarity action – including demonstrations, strikes and boycotts – featured in many campaigns in the first half of the twentieth century, and indeed earlier (anti-slavery, workers’ struggles, women’s movements). However, the enormous growth in number of transnational NGOs in the second half of the twentieth century has led observers to suggest there has appeared ‘a new force in international politics ... transforming global norms and practices’ (Khagram, Riker and Sikkink 2002: 4). The changes can be seen at various levels – the sheer proliferation of transnational advocacy, the spread of networks and the ‘density’ of their connections, and the outcome in significant changes in international standards. - the phrase ‘Think Globally, Act Locally’ was coined. In each of the areas mentioned, there have subsequently been significant ‘norm shifts’, especially since the end of the Cold War, that have been reflected in constitutional changes (indigenous rights in Colombia, gay rights in South Africa) and international conventions. ‘Top-down’ action can certainly advance an issue, such as when the UN – often in response to campaign groups – convenes a conference, declares an international year of concern or dedicates a particular day to an issue. However, the main motor for these changes has been citizens’ action around the world. A central transnational experience in the second half of the twentieth century was the momentous struggle against apartheid. The global anti-apartheid movement (a movement of citizens that also counted on the support of various governments) did not invent many new methods, but brought together a powerful repertoire of ‘people’s sanctions’ – not least in its anti-corporate campaigning where institutions (universities, churches, trade unions, municipalities) were enlisted into boycott and disinvestment campaigns. Apartheid was such a monstrous system that it demanded precedent-setting responses. An example from my work with war resisters is that for the first time the UN called on citizens to refuse to fight for their country, a precedent that led to conscientious objection becoming a ground for asylum first for South Africans and then more widely. Today various peoples – most obviously but by no means only the Palestinians – liken their situation to apartheid in order to appeal to the precedents set in the anti-apartheid struggle. Other campaigns have also proved formative in the spread of transnational activism on a range of issues. Rights-based campaigns – be they for human rights in general or to support particular groups denied their rights – have strengthened human rights instruments, including global and regional conventions and supra-national tribunals. Feminism, peace and ecology are also perspectives that cut across national frameworks. In many respects women’s movements are among the most highly developed transnational networks. Women’s networks have mounted powerful campaigns on various rights, against specific abuses such as human trafficking or genital mutilation, and in solidarity with women trying to change oppressive cultural practices, such as the network Women Living Under Muslim Laws. Women’s movements also insist that issues of peace and disarmament, responses to conflict, and economic and environmental struggles, should be seen as feminist issues. Solidarity with women workers has been a strong thread in campaigns against the exploitation of ‘cheap labour’ by multinational corporations and their subcontractors. Meanwhile the spread of a concept such as ‘livelihood struggle’ – that addresses the survival needs of a community in both economic and environmental terms – often entails recognising the local leadership role played by women who hold families and communities together. Transnational campaigns have targeted international institutions, states and corporations, or sometimes a combination of the three. Whether or not they have succeeded in attaining particular demands, overall they have built up the capacity for citizens groups to react transnationally on a range of issues and also have changed the terms of debate over a number of internationally agreed standards. Campaigns against specific instances of logging, mining, genetic engineering and mega-projects such as big dams have also changed the official terms of reference. While the campaign against the Narmada dams in India did not stop their construction, it did succeed in changing the policy of certain governments towards such projects and convinced the World Bank to withdraw and then sponsor an independent World Dam Commission to lay down standards for the future (Kothari 2002: 238). Certain concerted transnational campaigns directly address a global issue: the Campaign to Ban Land Mines and the Jubilee 2000 campaign for debt cancellation were outstanding examples (Donnelly 2002; Randle 2004). Less known perhaps but equally significant was the defeat of the Multilateral Agreement on Investment (MAI), one of the successful campaigns against expanding the ‘freedom’ of corporations. Currently the global campaign on climate change embraces many different perspectives and actors, but benefits from the connections forged in earlier campaigns. Anti-corporate campaigns such as the Nestlé boycott (for marketing baby formula as superior to mother’s milk), various campaigns against Shell (over dumping the Brent Spar oil storage buoy in the North Sea,[i] in support of the Ogonis in Nigeria or the U’wa in Colombia), the anti-sweatshop campaigns aimed particularly against designer garment manufacturers such as Nike – these have all pressured corporations to rethink their positions on corporate responsibility, encouraged too in 1999 by the Global Compact promoting ‘corporate social responsibility’ launched by then UN Secretary-General Kofi Annan. Such changes of attitude testify to the impact of campaigns, although it should also be recognised that corporations rarely acknowledge that they heed boycotters or that their profits are affected. Moreover, when corporations use ‘social responsibility’ as part of their public relations, making ‘statements of intention’ and offering codes of self-regulation, their change of strategy actually sets back campaigns for more fundamental change, for international monitoring and global enforcement. This critique has been made in detail in relation to sweatshops (Seidman 2007), logging (World Rainforest Movement 2008) and mining (Moody 2007 and at www.minesandcommunities.org). More widely the term ‘Greenwash’ has been coined, defined by CorpWatch (www.corpwatch.org) as ‘socially and environmentally destructive corporations, attempting to preserve and expand their markets or power by posing as friends of the environment’. This is now so widespread that CorpWatch makes bi-monthly ‘Greenwash’ awards to corporations ‘that put more money, time and energy into slick PR campaigns aimed at promoting their eco-friendly images, than they do to actually protecting the environment’, while in Britain in 2008 the Guardian newspaper has given ecological campaigner Fred Pearce a ‘Greenwash’ column. Throughout all these campaigns and the connected multiplication of monitoring groups, transnational citizen’s networks have been expanding their capacity to contest global institutions and multinational corporations. A central part of this capacity is counter-information. Credible information is central to the moral authority of citizens groups, and a host of groups are currently monitoring issues of transnational concern. Amnesty International (AI), founded in 1961, in many ways set the standard for impartial information and popularised one pattern for campaigning – local groups ‘adopting’ particular prisoners or cases and following them. Since the Worldwatch Institute was founded in 1974 – mainly monitoring environmental issues – the Watch idea has spread. Moscow Helsinki Watch was set up by Soviet citizens to check implementation of the Helsinki Accords of 1976, and in turn inspired the US Helsinki Watch, which grew into the multi-national Human Rights Watch. This monitoring is vital in strengthening the case of advocacy groups, in showing either the inadequacy of existing standards or failure to comply with them. It also can help maintain activist networks in a state of preparedness, aware – or able to update themselves quickly – about how the situations that concern them are developing and better able to respond quickly as the need arises. As a powerful tool for mobilisation, the web offers new variations of established forms of protest (letter-writing, petitions, graffiti and otherwise doctoring images) but on a new scale and with a new rapidity. The web played an important role in the ‘electoral revolutions’, but in terms of national communication rather than transnational protest. Repressive regimes have probably less to fear from transnational web protests than have multinational corporations. Perhaps the junta in Burma can simply ignore the 375,000 people around the world who quickly registered as ‘fans’ of Facebook’s ‘Support the Monks’ Protest in Burma’ site in October 2007, or it can try to block internet access inside the country. A multinational corporation, on the other hand, cannot prevent circulation of damaging information or images. For McDonald’s, the nightmare of their decision to prosecute the McLibel Two was compounded as the number of visitors to the McSpotlight website soared to more than a million a month. [iii] Nike’s refusal to accept an internet order for a personalised shoe carrying the word ‘sweatshop’, and the subsequent correspondence with the campaigner who had this bright idea, was broadcast far and wide on the web (Stolle and Micheletti 2005). Counter-information and the internet are seen as crucial elements in the effectiveness of transnational advocacy networks, and in particular in achieving what has been termed ‘the boomerang effect’ (Keck and Sikkink 1998). - mobilising its membership in mass letter-writing, petitions, ‘cyberactions’ and consumer action. Because Greenpeace has such a comprehensive campaigning repertoire, it is possible to see the ‘boomerang effect’ concentrated in the activity of one NGO. However, more frequently, it takes somewhat more diffuse forms – involving chains of connections and coalitions of groups, including both NGOs and movements, or through a rapid internet mobilisation. The flight of the boomerang might pass through NGOs and activist constituencies, media, government departments and intergovernmental institutions before returning to make a difference at the point from where it was thrown. If the ‘boomerang effect’ provides a useful image, it also illustrates some problems of transnational solidarity. The social movement scholar Sidney Tarrow notes that the boomerang works best when thrown upwards (in terms of global hierarchies of power) rather than horizontally towards parallel campaigns equally distant from metropolitan power centres. Moreover, ‘as the locus of decision-making move[s] upward’, that is as the boomerang reaches the most distant point in its flight, those in the locality most directly affected tend to have less say (Tarrow 2005: 157–9). In short, a coalition that originates as an act of solidarity reproduces some features of global power relationships. Returning to Greenpeace, the NGO has been the object of activist criticism for three decades – ever since the Vancouver Greenpeace Foundation established Greenpeace International to supersede the decentralised network of autonomous groups inspired by the original concept. In terms of campaign planning, Greenpeace’s approach is coherent with pros and cons open to debate. An entertaining book by one of its outstanding campaign directors (Rose 2005) shows that Greenpeace consciously presents itself as a David perpetually championing the planet against a range of Goliaths. It needs to be seen as a ‘protagonist’ if it is to maintain its considerable Western support base (2.8 million members worldwide, according to its webpage). It concentrates on easy-to-understand popular messages and also chooses various ‘easy targets’ (Rose’s ‘low hanging fruit’) to balance some of the ‘hard nuts’ it also tries to crack. Greenpeace rarely tries to connect campaign issues: a partial exception is made in the case of indigenous peoples – the communities often most directly threatened by environmental destruction. But Greenpeace is wary of supporting environmental campaigns linked with demands for self-determination, and it is rare to find Greenpeace referring to women’s or trade union rights. As one of the groups likely to advise campaigns to ‘reframe’ their message, Greenpeace would prefer to steer local campaigners away from contentious issues of where social power lies or what constitutes social justice into the comparatively safer waters of environmental impact. In sum, Greenpeace generally seeks results less in terms of local community empowerment than in changing the policies of the power-holders. Accusations of Greenpeace ‘taking over’ from local campaigners, or behaving more like a ‘green Svengali’ than a ‘movement mid-wife’ in helping local campaigners reframe issues, should not be accepted uncritically – some Greenpeace campaigners have been exemplary in respecting local movements. However, what is true – not just for Greenpeace but more generally for metropolitan groups who play a part in producing the ‘boomerang effect’ – is that such advocacy groups are tempted to behave in ways that eventually are resented by the local campaigns that are supposedly ‘beneficiaries’. Gaining ‘leverage’ should conceptually be a form of community empowerment, but in practice there is often a tension between these emphases. This is seen most clearly when there arises a disparity between what local movements demand and what is lobbied for by advocates near the seats of global power. Several commentators on North American solidarity campaigns with maquiladora (subcontracted workers) in Central America make related criticisms. Seidman takes issue with what she sees as the ‘human rights’ approach of mobilising concern through presenting sweatshop workers and others as mere ‘victims’ rather than as a force trying to organise themselves (Seidman 2007). Dominguez and Quintero (2008), studying Mexican maquiladora workers’ alliances with North American groups, note the paternalism of Canadian and especially US partners, and argue that Northern support for the process of ‘NGO-isation’ created divisions because local NGOs are not representative of, still less accountable to, the workers themselves. Armbruster-Sandoval, studying four cases of cooperation on anti-sweatshop campaigns, finds the boomerang concept useful, but suggests that, in over-emphasising the role of transnational advocacy, it ‘unconsciously marginalises (mostly “women of colour”) garment workers from narratives of resistance while privileging white, First-World, middle-class activists and consumers’ (Armbruster-Sandoval 2005a: 467). Furthermore, because of the global mobility of capital, ‘victory’ against a corporation tends to be temporary. A corporation might concede workers’ demands for ‘employment with dignity’ only to close the plant as soon as they have developed a cheaper source of labour as did Phillips van Heusen (PvH). In 1997 PvH workers in Guatemala won a six-year struggle for collective bargaining rights, considered a model of cross-border organising at the time. Yet 15 months later PvH closed the factory (Armbruster-Sandoval 2005b: 31). Armbruster-Sandoval suggests that in the final analysis what is necessary is not a boomerang but a struggle to transform global power relations such as we find in the global justice movement. There are several accounts where ‘boomerang’ has played a role. In Colombia, the army units who killed members of the peace community of San Jose de Apartadó now face prosecution, partly thanks to international pressure, while Congress has denied US military aid to that particular brigade of the Colombian army. Peace Brigades International (PBI) in Colombia can also be seen as part of a boomerang mechanism, producing authoritative eyewitness accounts of human rights violations. Other examples of ‘boomerang effect’ are: workers refusing to ship arms to Zimbabwe, Indian diaspora groups in Canada convincing Alcan to abandon a mining project in Orissa, while the European Court of Justice and UN bodies have condemned Turkey’s treatment of conscientious objectors to military service. Although these are ‘outcomes’ of transnational solidarity, the relationships of solidarity are not just instruments to achieve such results. Rather they reflect a deeper commitment. We can look at various networks that can and do fulfil boomerang functions in terms of leverage and access to resources but which are based on some sense of commonality/solidarity beyond the particular issue in question. One of these networks, and perhaps the one readers most readily associate with the term ‘transnational activism’, is the global justice movement. The movement that emerged as a response to capitalist globalisation and ‘neoliberalism’ has since played a major role in anti-war mobilisation, most notably with the biggest day of protest the world has yet seen – 15 February 2003. The movement’s identity is quite malleable. There are many for whom it is an expression of an attitude now popularised by the Zapatistas but historically inherent in anarchism and feminism: ‘changing the world without taking power’. Yet somehow many of the same people fail to be embarrassed by and even participate in the uncritical lionisation of politicians such as Brazil’s Lula and Venezuela’s Chávez. Participants in some of the big events – either the counter-summits such as Seattle (1999), Prague (2000), Cancun and Genoa (2003), or the World Social Forums – view themselves as part of a ‘movement of movements’ responding to many facets of the global power system. Various commentators refer to this as a ‘counter-hegemonic mobilisation’, offering movements a critical alternative frame to the existing world system, including capitalist globalisation, the ‘war on terror’ and other planetary threats. It is this convergence that gives the moment its freshness and transformatory character – the encounter between perspectives that are different yet have enough in common to intersect and enrich each other. Yet while the movement is strong on critique and on vision, it is weak on strategy. It is clearly much more difficult to devise effective strategies against a global power system than it is to tackle its ‘worst excesses’. Bill Moyer devised his Movement Action Plan (MAP) model to help social movement activists address issues of strategy, and in particular to recognise their achievements and not lose heart over setbacks. One of several points that distinguishes his approach to campaigning is that Moyer urged movements not only ‘to advocate reforms to redress symptoms of social problems, but to promote a paradigm shift, a change in the larger worldview that causes and maintains the problem’, ultimately to insist on social change rather than the minimal reforms that power-holders would prefer to concede (Moyer et al. 2001: 71). To some extent, through its combinations of issues and perspectives from different parts of the world, the global justice movement adds this element of ‘paradigm shift’ to existing campaigns. Therefore, instead of seeing the desire of activists to ‘embrace diversity’ as a source of strategic weakness, it can be a strength, as Tarrow has argued: ‘Global justice is an effective frame for domestic contention because it facilitates the condensation of many distinct targets in the same protest campaign ... Global justice has proven an excellent frame-bridging symbol. ’ Nevertheless, continues Tarrow, the global justice movement (and other transnational coalitions) still faces the strategic challenge: how to ‘construct a template that is both relevant to local issues and resonates with the broader theme of global justice’ (Tarrow 2005: 74–5). Realising the potential of global movements for transformation depends on maintaining or constructing relationships and networks of solidarity with both vertical and horizontal axes. If movements look vertically for transnational leverage, then they should be advised to look horizontally for inspiration and mutual learning, as seen in Chesterfield Samba’s work on lesbian and gay organising in Africa and Cynthia Cockburn’s work on Women in Black (Cockburn 2007). This is a time when the global justice movement is in one of its less optimistic phases – some even suspect it is coming to the end of its life-cycle. The reality is, as the late Bill Moyer would have pointed out, in the excitement of the take-off stage of the movement, unrealistic expectations are generated leading to disappointment and loss of momentum. The appropriate response is for activists to recognise what they are doing well, to strengthen their structures and in this case deepen the relationships of transnational solidarity, not seeking short-term results as much as grounding the movement for the long haul. Republished from H. Clark ed., People Power: Unarmed Resistance and Global Solidarity (Pluto 2009), pp. 11-19. [i] Although Greenpeace itself lost some credibility through exaggerating the residues to be dumped. [ii] It also helped that the seat of the body negotiating the MAI – the Organisation for Economic Cooperation and Development (OECD) – is in Paris. The MAI negotiations there in 1998 became the focus for mobilisation in France, which resulted in French government withdrawal and the foundation of one of the central networks of the global justice movement, ATTAC (Association pour la taxation des transactions financières pour l’aide aux citoyens). [iii] Prosecuted for libel, Dave Morris and Helen Steel succeeded for nearly three years in turning the courtroom into a tribunal on McDonald’s – losing the case despite the judge ruling that most of their criticisms of McDonald’s were reasonable. See www.mcspotlight.org.